What Day Of The Week Is October 22? 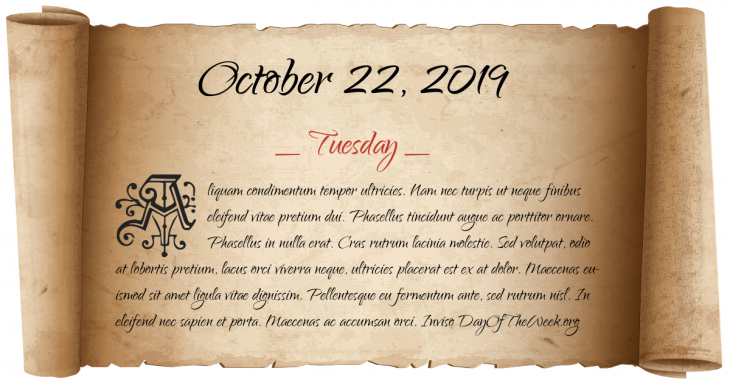 October 22, 2019 is the 295th day of the year 2019 in the Gregorian calendar. There are 70 days remaining until the end of the year. The day of the week is Tuesday. The Great Anticipation: Millerites, followers of William Miller, anticipate the end of the world in conjunction with the Second Advent of Christ. The following day became known as the Great Disappointment. In Paris an express train overruns a buffer stop and crosses more than 30 metres of concourse before plummeting through a window at Gare Montparnasse. World War II: in the Second firestorm raid on Germany, the Royal Air Force conducts an air raid on the town of Kassel, killing 10,000 and rendering 150,000 homeless. Cuban Missile Crisis: US President John F. Kennedy, after internal counsel from Dwight D. Eisenhower, announces that American reconnaissance planes have discovered Soviet nuclear weapons in Cuba, and that he has ordered a naval “quarantine” of the Communist nation. Red Dye No. 4 is banned by the US Food and Drug Administration after it is discovered that it causes tumors in the bladders of dogs. The dye is still used in Canada. Who were born on October 22?